Mercury is now regarded as the most common cause of heavy metal toxicity and can get into the bloodstream in various ways from injected vaccines, eating fish and by amalgam dental fillings by chewing. The World Health Organization estimates that between three to 17 micrograms of mercury are released daily into the body by chewing alone. Mercury is the second most toxic metal in the world after plutonium. Mercury has a history of being known as quicksilver due to it being a silver liquid. The symbol, Hg, is Latin for hydrargyrum, meaning watery silver. Mercury does not readily react with oxygen in the air but does reacts with some acids when they are hot. Mercury toxicity has been reported since the first century when Roman prisoners were sentenced to work in cinnabar mines where they usually died due to the lethal levels of mercury. In the 1800s felt hat workers exposed to mercuric nitrate exhibited symptoms such as memory loss, angry outbursts, depression, insomnia, hallucinations and delusions. This condition was coined the “Mad Hatter syndrome” and was referred to famously by Lewis Carroll in Alice in Wonderland. Similar symptoms were reported in syphilis patients who were treated with mercury in the mid-19th century. In the last 50 years, more has been discovered about the toxic effects of mercury. Mercury enters the body fairly easily and its vapours pass through the skin into the blood stream. Once in the blood mercury interferes with bodily chemical reactions that can lead to illness and even death. Mercury consists of approximately 50% of an amalgam filling, and is mixed with silver, copper and tin. This combination has been used for well over a century and has proved to extremely durable. Mercury is used in amalgams because it helps it is effective in making the filling material pliable and it also hardens quickly and can withstand biting and chewing. The US Food and Drug Administration (FDA) caused controversy in July 2008 when they issued a final regulation with altered language on their website: "While elemental mercury has been associated with adverse health effects at high exposures, the levels released by dental amalgam fillings are not high enough to cause harm in patients.” They also advocated better warnings about mercury sensitivity and dental amalgams. The association also reclassified the mercury component of dental amalgam from Class I (low risk) to Class II (moderate risk). With increasing concern over the safety of amalgam fillings, more than five hundred mercury-free practices have been set up in the UK. There are alternatives to amalgam fillings such as composite resin, porcelain and gold. The durability of these alternatives is increasing with time and further research. Removing existing amalgam fillings isn’t advised in healthy people as it is a skilled procedure and involves the release of mercury vapour. A report in the British Journal of Industrial Medicine finds that dentists have higher concentrations of mercury in the body and double the number of brain tumours. Female dentists and assistants have more than three times the risk of sterility, stillbirth, and miscarriage. Exposure over long periods of time to mercury vapour can result in brain damage and studies have found extensive mercury exposure to be a factor in Alzheimer’s, Parkinson's disease, dementia and multiple sclerosis. Mercury is particularly toxic to fetuses and babies. Women who have been exposed to mercury in pregnancy have sometimes given birth to children with serious birth defects. A study that followed more than 500 Portuguese and American children for seven years after they received amalgam or mercury-free fillings found no differences in the neurological symptoms between the two groups. In contrast a 2004 study concluded that amalgam fillings may be an important risk factor for patients with autoimmune diseases. 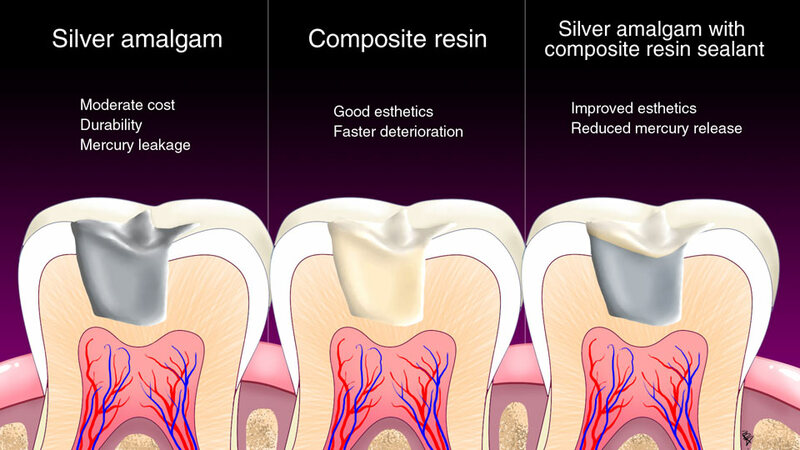 The study found that patients responded positively when amalgam was removed from a group of 35 patients with autoimmune diseases and replaced them with composites. Six months later more than 70% had shown improvement in health notably in multiple sclerosis. Supporters of amalgam fillings emphasised that mercury is locked in and inert. It has now been conceded that mercury vapour escapes, and filters into the bloodstream and organs. Now scientists and the FDA claim that mercury levels are very low. Opponents argue that mercury accumulates in the body and no level of mercury should be deemed safe. Insufficient published data exists on the potential health effects of dental amalgam to completely support or refute the health effects attributed to it. The safety of amalgam fillings is still inconclusive, though due to the toxicity of mercury an increasing amount of people are choosing alternatives such as composite resin, glass and gold. Read Ayurvedic Home Remedies for Tooth Pain for natural ways to maintain optimal oral health and treat toothache.